Pee S: We need to mention that we originally thought my dad took this picture, but he just saw it somewhere and sent it to my mom. If it's your picture we'd be happy to give you credit, just let us know! 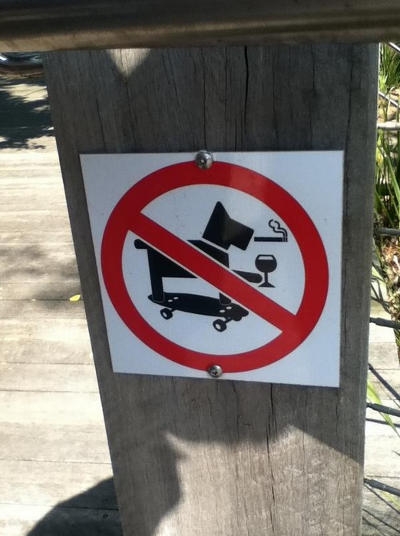 OMD never seen a skateboarding, drinking, smocking dog before. Have a wonderful Wednesday. We can't have any fun! That's a very talented dog - smoking and drinking while skateboarding! Why do they have that ugly red slash through him? BOL! Dat sign is a real pawty pooper sign. Not thats just not right...thats everything I can do! Instructions on how to pawty! Dat dog looks like fun.